Fire. The most chaotic of the primal elements. When wielded properly by the Knight of Flame, it burns like the sun. Otherwise, it slowly consumes the Knight, burning away his control, driving him towards dark deeds. Stationed in Tampa, FL, Develore Quinteele, sixth Knight of Flame, waits impatiently for the predicted emergence of the last Gray Lord, his Order's ancient enemy. Hampered by a centuries-old tragedy, Dev knows of only one way to control his elemental power—rage. It broils just below his surface, waiting for the slightest provocation to set it alight. Anticipating Dev's transition from asset to liability, his commander assigns a young guardian, Wren, to report on Dev's actions. Torn between duty and love, Wren struggles to save her Knight; but, after a brutal attack by the Gray Lord's minions for which Dev is wrongly blamed, he's stripped of his freedom until he regains control. With the help of his fellow Knights, can Dev regain his balance and unlock his full elemental potential in time to prevent the destruction of all life in Tampa? Have you ever read a book and wanted to leap into the pages to experience the glorious settings first hand? The beautiful prose of a fully realized environment transports the reader to stunning locales alongside the characters, evoking smells and sounds, sights and emotion, providing a safe environment in which to vicariously experience the thrills of the story. When reading, The Hobbit, by J.R.R. Tolkein, who didn't want to explore the lush greens and pastoral comfort of The Shire, or the lofty spires and breathtaking elegance of Rivendell? I'd love to scuff my dwarf-made boots through the venerable halls of Erebor, after Smaug's demise of course, drinking in the majesty of the dwarven heritage. Thanks to Peter Jackson and his movies, we can experience The Shire in New Zealand. How cool is that? A trip Down Under is definitely on my bucket list. But what about the other amazing fantasy worlds we've come to love? Shannara, Midkemia, Earthsea, Discworld, The Land, Oz, Narnia…the list goes on. Sure, we can visit those places in our heads, imagining glorious treks across primitive, and sometimes hostile, environments, all from the relative safety of our favorite reading spot. What about the fantasy stories that occur in the here and now using real-life locations as the backdrop? Depending on to whom you speak, these types of books fall into the contemporary, or urban, fantasy genre. What this means is that the novel is set in an alternate version of our current world, and includes the fantasy tropes we've come to know and love. In some cases, magic is real and fantasy creatures abound. Whatever the author's premise, at least some aspects of the story are grounded in bona-fide places. Jim Butcher uses an alternate version of Chicago, much like Kim Harrison explores Cincinnati, utilizing existing landmarks to resonate within the reader's own experience. By resonance, I mean something within the story strikes a familiar chord with the reader, broadening the meaning of the words on the page to make them more personally impactful, and enriching the overall experience. Hmm, that's a mouthful. Let me explain using examples from my debut novel, Knight of Flame, and how some of the real places that appear in the story strike a chord every day. I lived in Bradenton, FL and commuted to St. Petersburg for years and years. Every day, when it wasn't fogged in, I drove over the Sunshine Skyway Bridge. While crossing over the water, my mind wandered from topic to topic, rarely did it focus on the majesty of that soaring span, or the scenic vista available from the top. I was driving at the time, so partaking of stunning views probably wasn't a good idea, but you get my meaning. All the bridge represented was a means of getting to work. I'll admit that on occasion I did see dolphins swimming in the bay, which was pretty cool. Enter Develore Quinteele and Alexander Gray, two characters from Knight of Flame. I won't give any spoilers here, but there's an epic battle atop the bridge, magic and mayhem galore. And it happens on the same bridge I crossed every day on my way to work. Granted I live these stories now, but I can't see the bridge without thinking of the characters and what happened. It's like a mental souvenir of the story. Perhaps a commuter, driving over the bridge after having read Knight of Flame, would think of that battle, maybe replay it in her head while stopped in traffic, imagining what she would do if that battle broke out across the span. If nothing else, thoughts like that can liven up an otherwise boring commute. The same holds true for the Regions Bank building in downtown Tampa. It's the tallest skyscraper in the Tampa skyline. I don't think it's a spoiler to say it's the building where I set Alexander Gray's office, the local headquarters for Daegon Gray. On a clear day, its green-peaked roof can be seen a long way off. Whenever I see it, I picture a corner of the roof opening to admit Gothrodul, Alexander's associate. The simple sight of the building triggers those story memories. 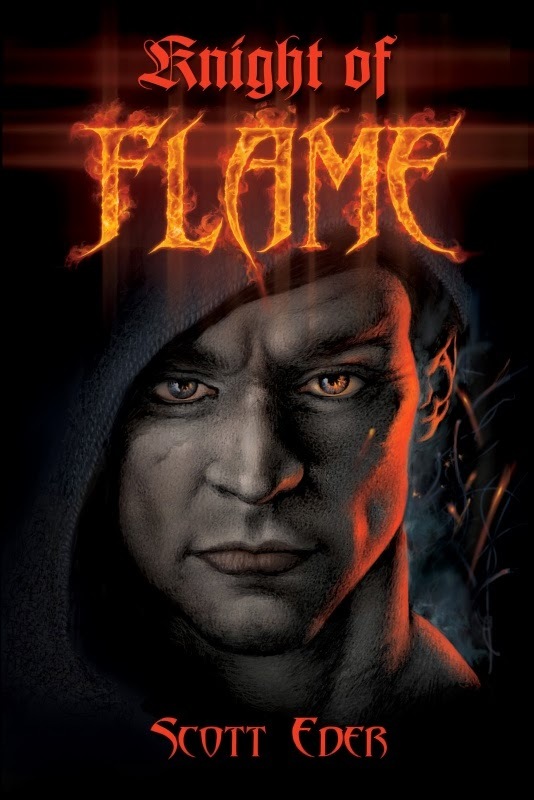 Knight of Flame is but a single story with a few real settings a reader can physically visit. Think of all the other stories out there with real-world settings waiting for the step of the intrepid reader. Explore. Find the author's inspiration, and see how the actual differs from the alternate carefully crafted in the story. Now, get out there. Have fun, Scott Against the Shadow, burns a noble light. Since he was a kid, Scott wanted to be an author and explored many genres through high school and college. Fantasy, though, captivated his soul. Tales of Knights and magic, dragons and elves filled his dreams. After greasing the gears of the corporate machine for many years, he escaped the Information Technology vortex to focus full-time on writing. The stories he'd envisioned years ago—of nobility and strife, honor and chaos—demanded they be brought to life. Scott lives with his wife, two children, and a giant Chihuahua on the west coast of Florida. Fire is known as the most disordered of the primal elements. When exercised properly by the Knight of Flame, it burns like the sun. You will get more info here now. Or else, it slowly devours the Knight, burning away his control, driving him towards dark performances. Stationed in Tampa, FL, Develore Quinteele, who is the sixth Knight of Flame, waits intolerantly for the forecast appearance of the last Gray Lord, his Command's earliest foe. There is some description relevant to a book on the webpage. The name of the book is Knight of flame. The author of the book is SCOTT EDER. Come and check here for further details. It seems to be some war sort of book but in case you are also curious like me then buy it today and read it. You would love it. When we talk about the book named Knight of Flame then we can say that this is a beautiful prose of a fully understood environment conveyances the reader to spectacular locations together with the characters. I found this source very supportive. It also induces smells and sounds, sights and emotion, providing a safe environment in which you can feel the thrills of the story. Understudies who don't care for learning in schools flop energetically to leave the school since, they don't prefer https://www.paraphraseservice.org/our-paraphrasing-services/apa-paraphrasing/ to achieve training. These youngsters are causing the decimation of our exquisite world since they are our future. Book writing is an big challenge for every writer. A good book review you have shared and thanks to the author for writing wonderful book. Also check this out to choose our rephrase generator and writing services. Reader should love to read this informative book to increase there knowledge. Thanks again.